Martin is a hamlet in the parish of Langdon, about 4½miles northeast of Dover. There has been a settlement there since at least Anglo-Saxon times. In AD 861, it is listed as Meretun, which means ‘farmstead by the pools’. In old guidebooks, the hamlet is referred to as Marten, Marton, Merton, Mershton or Marshtown. The latter because of the Marsh family who live there for centuries and the hamlet’s main landowners. During the reign of Henry V (1413-1422), their name was written as Atte-Mersh and their arms were, quarterly, gules, and argent, in the first quarter, a horses head, couped at the neck, gules. 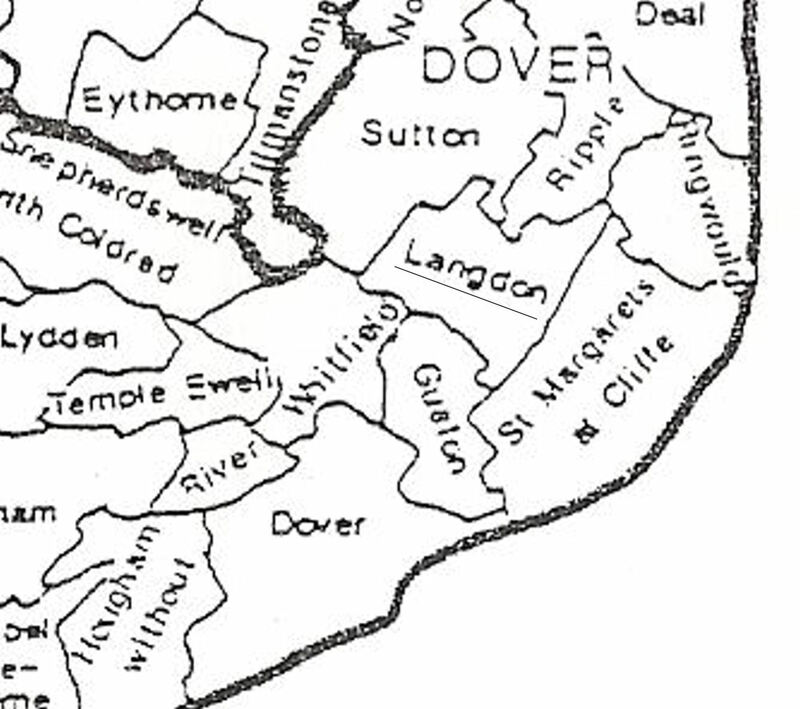 At that time, Langdon Abbey owned the hamlet but following the Reformation (1529-1536), it came into the possession of the Master family of East Langdon. It then passed to the Furnese family of which, Selina, one of three daughters of Sir Robert Furnese, passed it to Sir Edward Dering as part of her dowry. About 1780, the estate was sold to John Jeken of Court Lodge, Oxney, by which time the large and noble manor house was in a ruinous state. His son, James had it demolished and built Marston Hall that can be seen today. A legend attached to Marston Hall was used by Richard Harris Barham in one his Ingoldsby Legends. The story is about Thomas Marsh who was once the squire of Martin, however, Barham gives the legend the title, ‘Mrs Botherby’s Story – The Leech of Folkestone,’ which can be confusing. The story tells us that Thomas was the youngest of three sons of a wealthy Martin yeoman. He left home to seek his fortune on the Continent, returning to Martin following the deaths of his father and two elder brothers. He brings with him his young Spanish wife, Isabel, and daughter Marian. With his own wealth and that which he has inherited, Thomas prospers such that he hires his wife a handsome, young, footman called José. In those days, apothecaries travelled from manor to manor selling their lotions and potions, and Erasmus Buckthorne of Folkestone, the Leech of Barham’s title, was no exception. However, on this particular visit to Martin he had with him a special doll with spells and pins secretly ordered by Isabel. Buckthorne arrives at the manor just as Thomas is about to leave on a journey to Romney Marsh with his manservant. After Thomas’s departure the apothecary explains to Isabel how the talisman works and she immediately plunges two of the pins into the doll. At that same moment, Thomas suffers pangs of excruciating pain. Isabel is about to stick more pins into the doll when she is called away leaving the doll on her dresser. Young Marian finds the doll and takes it to her room, where she pulls the pins out. Thomas’s agony stops. Isabel returns and is in great consternation over the missing doll. That evening Thomas and his manservant arrive at a village, probably Acrise, where a fair was being held. There, much to Thomas’s surprise, one of the entertainers, Aldrovando, singles him out and tells him to be at a certain house, in Acrise Wood, that evening if he wants to live. Thomas, at first scoffs as he knows the house to be desolate. However, as the evening passes he thinks about the pain he had suffered earlier that day and decides to keep the assignment. The house is more desolate than Thomas remembers and he is about to change his mind when he sees that the door is open. Inside Aldrovando is waiting and bids Thomas to undertake a number of strange rituals. Thomas reluctantly obeys. What Thomas does not know is that at that very moment, Isabel and José, having found the doll, were casting spells and sticking pins into it. Because of Aldrovando’s magic, none of this affects Thomas. 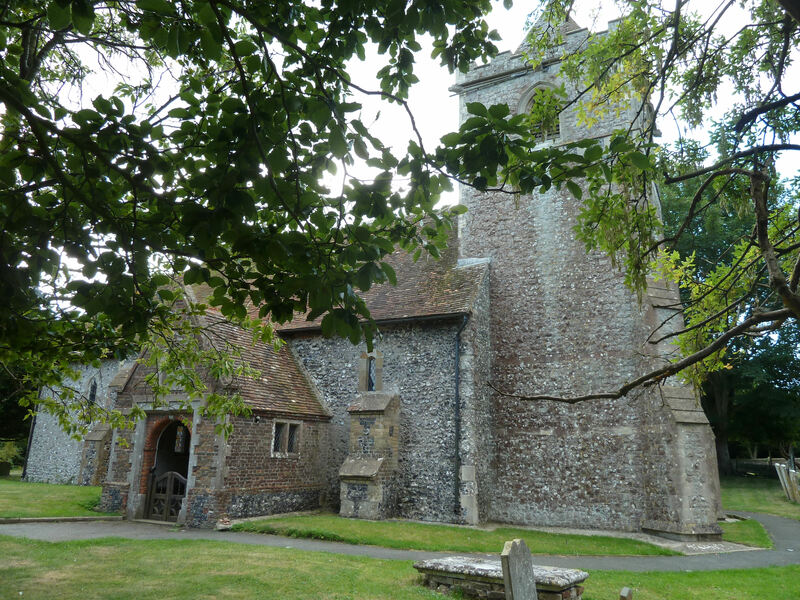 St Augustine’s Church, East Langdon, where Thomas Marsh is buried. Next morning Thomas is found wandering in a daze by his manservant. He takes his master back to Martin where calamity rules. Both Isabel and José have vanished, without packing taking money or anything! They had disappeared and were never seen again! Thomas, of course, recovers and he and Marian live happily ever after. The story is based on fact. Thomas Marsh was born in 1583 and following his death in 1634, was buried in St Augustine’s Church in East Langdon. Prior to the building of Martin waterworks in the 1800s along what is now Waterworks Lane, locals either collected rainwater or drew it from one of two very deep wells. One of these wells was at Marston Hall and a large donkey wheel was used to draw the water for, amongst other things, to make beer. The house was put on the market in 1921 along with 43 acres, 5 cottages a granary and a brew house. The tiny brewery still had its original coppers when modern equipment was installed in the 1980s and brewing was re-introduced. This ceased due to the ill health of the owner and the house was on the market in 1999. At that time the old brew house, an ivy-covered granary along with the donkey wheel was listed as main features. Nearby is the Lantern Inn that was built in 1636 as two farm cottages. 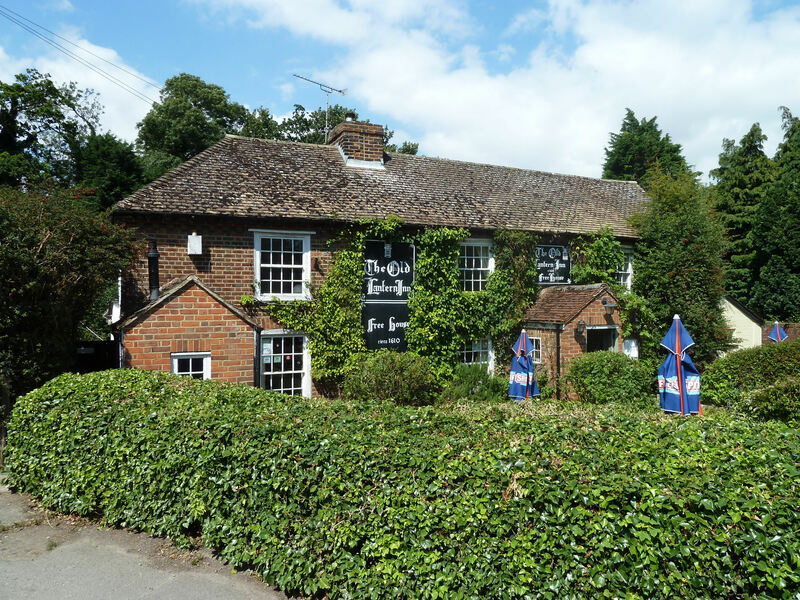 It was described as fine example of an English village freehouse with historic, period features at the time it was bought by Julian and Nancy Paton-Smith in1997, the present owners. A reputation it still holds. The cottages were licensed to sell ale in 1803 but some ten years later they had been converted and become the Wheatsheaf alehouse. It was not until 1936 that the establishment was granted a full licence when it became the Wheatsheaf Tavern. The name was changed to the Old Lantern Inn in 1976. 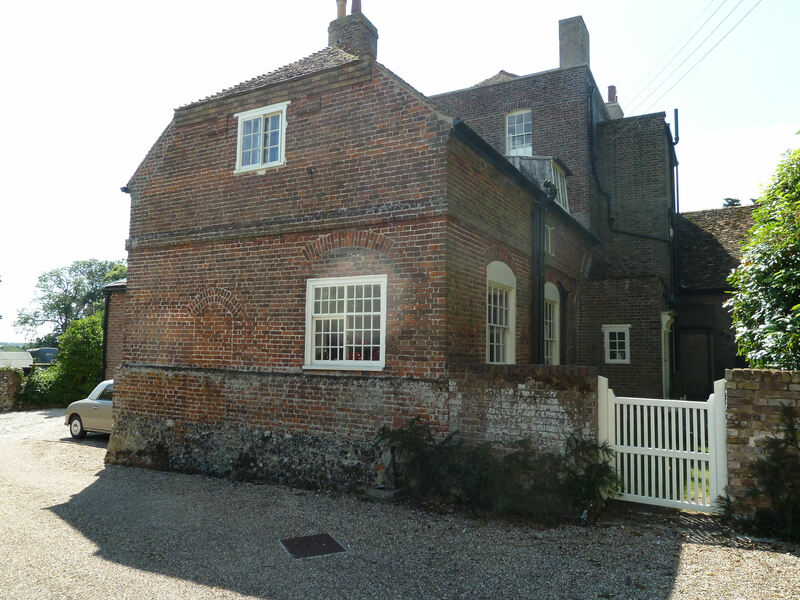 A workhouse was built in the hamlet in 1790 that housed the poor from East and West Langdon, St Margaret’s, Guston, Mongeham, Sutton and Ripple. The inmates, some 40 to 50, earned their keep by spinning and weaving linen, sack-making and sheeting. It closed in 1837 and the premises were renamed Prospect Place. The hamlet of Martin is in an arable farming locality with only fifteen houses and a windmill in 1790. The ancient windmill was situated on an elevated spot near where the South East and Chatham Railway built the line between Dover and Deal. It was here that the Railway Company erected a station in 1881 calling it Martin Mill. The station became the main transit point for passengers from London to St Margaret’s Bay. 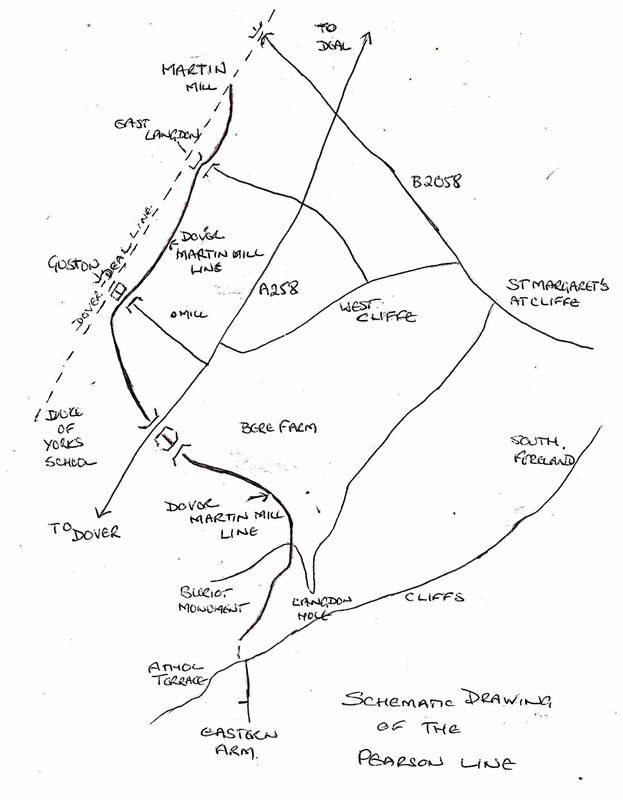 In 1898, Pearson’s laid the three and a half mile Dover-Martin Mill Standard Gauge Railway from Martin Mill Station to what is now Eastern Docks, to convey materials for the Dover Admiralty Harbour works. At the height of the construction, some 90 trucks a day passed through the station onto the branch line until that harbour was completed in 1909. By that time a new community had grow around the station and today Martin and Martin Mill are separate villages of equal size. During World War II, members of the Martin Women’s Institute converted a row of ancient cottages opposite the site of the workhouse into a small factory to make strawberry and blackberry jam as part of the war effort. These cottages were later combined into one house, called Tiled Cottage that still stands today. This entry was posted in Langdon, Martin and the legend of Thomas Marsh. Bookmark the permalink.